New life is breaking through in Northumberland with the year's first new Kielder ospreys having hatched. While the ospreys'breeding season at Kielder Water & Forest Park has been delayed slightly by weather conditions, such as the Beast from the East, a flourish of hatchings have now begun with the first two chicks breaking through within two hours of each other - on the same nest! 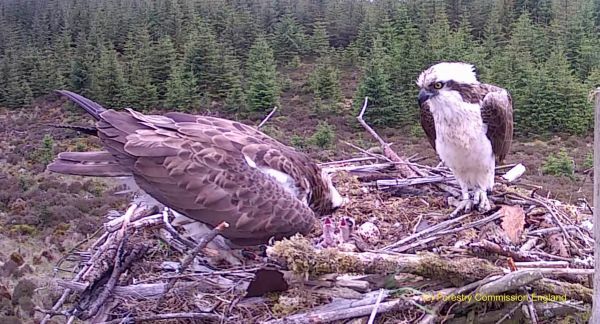 The new additions to the Kielder osprey family continue Kielder's ‘soap opera in the sky', following a flurry of‘cast'changes earlier in the season. While one regular, a male osprey that normally makes its home on nest three, failed to return, he was replaced by a newarrival that hasquickly settled in with the usual female. Three eggs have been spotted on each of the four nests, leading to optimism that 2018-the tenth year that ospreys have bred at Kielder-will be a bumper year for young osprey hatchings. Kielder osprey expert volunteer Joanna Dailey said:"We should see a flurry of activity now as the eggs start to hatch, bringing another year of new life to the Kielder osprey story.The time between the first two chicks is possibly a UK record for the shortest interval between hatches, although eggs have hatched within 24 hours on a number of nests, including Nest 4 last year. "Now comes the tough part for the chicks, as they strengthen and prepare to fledge, so that they can hopefullythriveand be ready for their migration at the end of the summer." Kielder Osprey Watchruns on weekends and bank holidays until mid-August, with additional Wednesdays from July.